This Pumpkin Pie Oatmeal is a fast and easy fall breakfast full of pumpkin spice. Top this Pumpkin Pie Oatmeal with pecans and a drizzle of maple syrup for a real treat. I started Orange Theory for the first time this week. If you don’t know what Orange Theory is, it’s a one hour work out class where you wear a heart rate monitor and you try to get your heart rate in the orange zone which is a certain heart rate, different for every person. It is killer. It’s been a long time since I’ve pushed myself so hard I almost threw up. I feel like I’m at a disadvantage though. When I was 9 months pregnant in the hospital having a baby, the nurses kept coming in because my heart rate was so low that it was tripping an alarm. Really? Really? How athletic do you think I can be at 9 months pregnant? Trust me. Not an ounce of athleticism happening here. I made this pumpkin oatmeal four times in two days to get it right. I set out bowls labeled ‘A’ and ‘B’ for my family to try. Yeah, I think they might need a couple of weeks until they’ll actually want to eat this Pumpkin Pie Oatmeal again. Here’s why I love this. It’s a quick and easy breakfast that seriously tastes like fall. I love these Pumpkin Cream Cheese Muffins but this breakfast takes less than five minutes. I love oatmeal and with just a little pumpkin and some spices, it’s fall in a bowl. I tried it with more pumpkin and it just made the texture too slimy. Too much pumpkin pie spice and it can almost be bitter. So there’s definitely a happy medium where everyone is playing nice together in the bowl. I dare you to add a little whipped cream. Um, heaven. In a large saucepan, combine the oats, milk, water, pumpkin, and pumpkin pie spice. Whisk to combine. Bring to a boil and cook for 5-10 minutes. Remove from heat. Stir in vanilla and brown sugar to taste. Top with chopped pecans, maple syrup, butter, and whipped cream if you're wild. 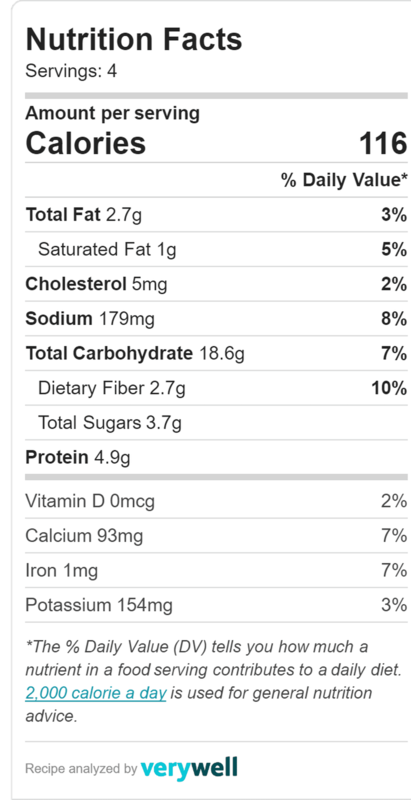 Nutritional Information is without the brown sugar since we add that to taste. I just so happened to have the items listed in my apartment, so I decided to give this recipe a try. I have NEVER been a fan of oats before, but holy cow this was delicious! I am so incredibly excited to make this for friends and family in the future. Definitely makes enough to serve more than one person. Yay!!! I’m glad you liked it. I didn’t miss a breakfast without oatmeal on the kitchen table. Boil uncovered? Reduce heat after bringing to a boil? Yes, I boiled uncovered. Bring up to a boil them reduce to a simmer. Love this, tastes devine. But my question is “where did you get your bowls?” I love them and need to have some. Homegoods. They look like ceramic but they’re plastic (hello i have 5 kids). Do you have a calorie count on this? It look amazing!! Can this be made ahead of time and heated up in the microwave? looking for a breakfast i can make ahead and bring to work! thanks! We totally heat ours up in the morning so yes! YUM! This oatmeal is calling my name! Ruth, there’s no way this recipe cooks for a crowd. It calls for 1 cup of oats. This looks amazing!! I can’t wait to try it. I will report back! I wish you would put how mANY SERVINGS YOUR RECIPES MAKE. I’m just one person and don’t want to cook for a crowd! When I make oatmeal for 1 use 1/3 cup oats and 2/3 water. So perhaps cut the recipe in half and start from there? Sorry. I forgot to add servings!